Today is a positively gross day. The temperature has hung in the mid-40’s and it is pouring rain. All plans of productivity have basically been halted…don’t get me wrong – there are about a million other things I need to be doing right now other than: Couch. TV. Knitting. Studying. Web-Surfing. But then I got hungry. And there was no way I was going out. I decided I better whip something up from my pantry/fridge/freezer stash. Because it has actually grown to a bit out of control. And I wanted something warm. Soup. I was thinking about the yummy coconut broth soup with veggies that I get sometimes at the Thai place. It’s full of tons of vegetables, and big cubes of Tofu. Confession time: I don’t really love or even like tofu. It’s okay. When it’s cooked right, it’s even kind of awesome. But when it’s cooked wrong, it’s terribly wrong. It’s totally a texture thing for me. So, that settled it. 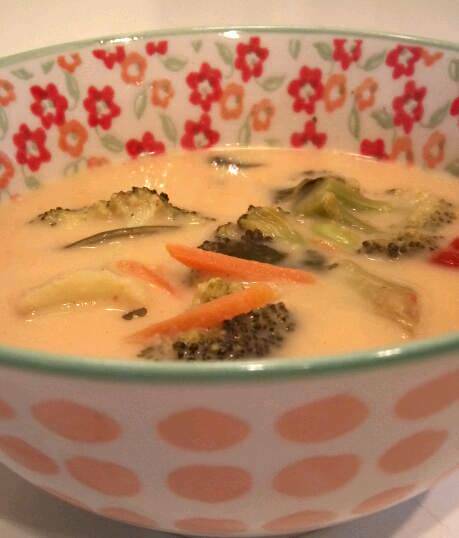 Coconut Thai Vegetable Soup, sans Tofu. I didn’t take a ton of pictures while I was making, it because I wasn’t totally sure it would turn out eatable, mainly because most of the recipes online had a ton of ingredients that I wasn’t including. But, it is actually pretty awesome. Even in an I’d make this again kind of way…so I am sharing. Beyond the coconut milk and lime/something tart, the recipe is pretty flexible, so feel free to substitute and make it to your taste. You could even add meat, if that’s your style. Yeah, no tofu! I am trying out some recipes without the stuff so I can feed some non-vegans without forcing the dreaded “tofu” on them! Thanks! 🙂 Perfect! Let me know how it turns out! Pingback: Grown Up Black Bean Soup [Vegan/Gluten Free] | Make them whole foods. Make them delicious. And make sure you feel great eating them. Pingback: The Fall Bug Has Bit | Make them whole foods. Make them delicious. And make sure you feel great eating them. Holy crap, thank you so much for posting this! It is going to aid me when I buy Coconut Milk at the store! Super Amazing! So glad to help! I can’t wait to hear how you like it! Holy crap, thank you so much for posting this! It is gonna aid me when I research Coconut Milk at the market! Super Stupendous!